Hello Friends, It’s Saturday and you know what that means. It’s time for a brand new challenge over at Just Us Girls. 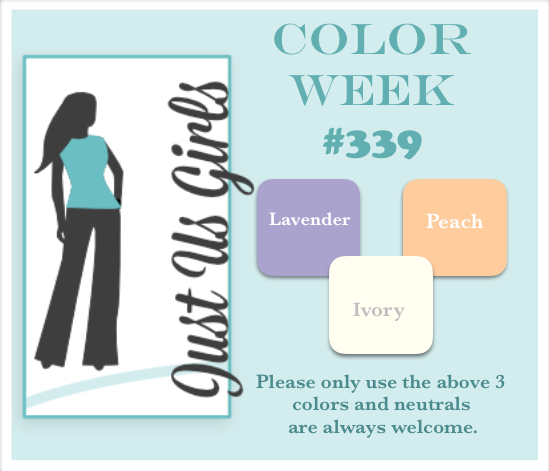 Judy is our hostess and she has selected a great trio of colors for us to use. I must admit at first I was really struggling with these colors, but after digging through my drawers of paper and coming across this piece of Bo Bunny peach polka dots, I felt much better. Peach isn’t a color I have a ton of….do you? Anyhoo, I also knew I wanted to play along with the sketch over at Viva la Verve, so things came together perfectly at that point. If you find yourself with some time over the next week to be creative….come on over to JUGS and join us! We would sure love to have you in our gallery! I hope you have a fantastic day! Nanc’ All stamps are from Verve BTW! PRETTY! Loving all of the Polka Dots….the colors really POP! Adore the Vellum leaves too! So pretty. Love your card Nancy. The peach polka dot paper looks lovely with those pretty Verve flowers. Beautiful card, Nancy. I love that scalloped square and all the polka dots. That is a beautiful card. I love those colors together too. Love your card! What a great idea to use vellum for the leaves. (smacking my head and saying, why didn’t I think of that for my card! LOL!) You used the colors fabulously! I’m loving the polka dot background and your pretty design. Lovely use of the challenge colors! Fabulous take on that sketch Nancy. Love those gorgeous flowers and the vellum leaves are just perfect. Love all the dots and the layout so much!!! Beautiful!!! LOVE this!! The polka dot background is so cute, and so is the ribbon. And then those flowers with the vellum leaves. Just really pretty, great take on the colors. 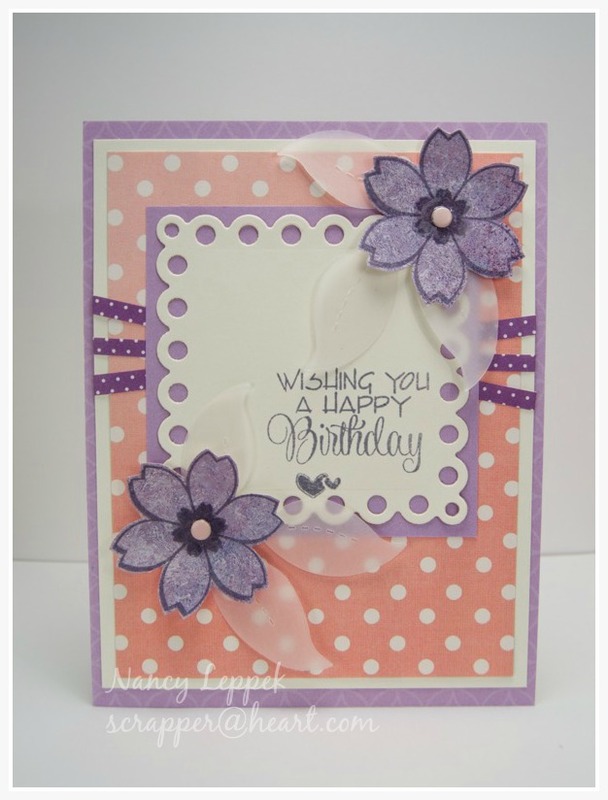 The polka dots are so fun…such a pretty card! I love the soft look of vellum,too. This is beautiful! You nailed it with the colors. Those flowers are so pretty and I love the addition of the vellum leaves. Oh, how fabulous are those vellum leaves? Such a pretty card, Nancy! Thanks for playing along with Viva la Verve!